쌍계사대웅전(보물 제500호)에 보존되어 있는 그림으로, 중앙의 석가모니불도를 중심으로 왼쪽에는 약사불도, 오른쪽에는 아미타불도를 배치한 삼세불탱화이다. 석가모니불도는 화면 상단 중앙에 큼직하게 본존불을 그린 다음, 좌우 대칭이 되게 문수·보현을 비롯한 8대보살과 제석·범천, 2위의 타방불, 가섭·아난존자를 비롯한 10대제자, 용왕·용녀와 6금강, 2위의 사천왕을 배치하였다. 본존불은 17∼18세기 유행의 전형적인 키 모양의 광배에 악귀를 물리치는 뜻을 가진 항마촉지인의 손모양을 하고 있다. 정수리에는 상투 모양의 육계가 뾰족하며, 머리에는 중앙계주와 정상계주가 큼직하고 귀·눈·입·코 등은 단정하나 몸의 형태가 네모꼴을 이룸으로써 18세기 후반의 불화들에서 나타나는 경직성을 느끼게 한다. 아미타불도는 주불을 비롯하여 주위에 빙둘러서 관음·세지보살을 포함한 8대보살과 2위의 사천왕, 2위의 타방불, 마치 16나한의 모습과도 같은 10대제자를 배치시켜 놓았다. 이 삼세불도는 18세기 전반 전라도지역에서 크게 활약했던 대표적 불화승 ‘의겸’으로부터 1780년대의 ‘승윤’ ‘평삼’으로 이어지는 불화승의 계보를 파악하는데 중요한 역할을 할 뿐만 아니라, 완전한 형태를 갖춘 18세기 후반의 대형불화로서 비교적 정교한 필치와 화려하면서도 은은함을 보여주어 화풍파악에 있어서도 빼놓을 수 없는 뛰어난 작품으로 평가된다. 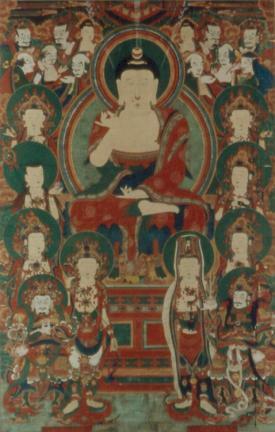 In this painting of the Buddha triad, which is kept at the Main Hall (Treasure No. 500) of Ssanggyesa Temple, Shakyamuni Buddha is at the center flanked by the Medicine Buddha and Amitabha Buddha. 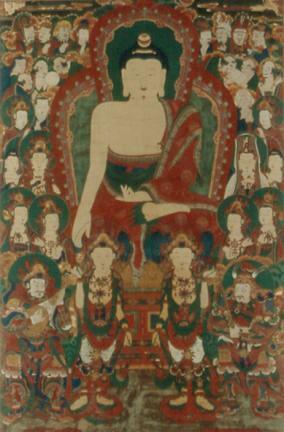 The image of Shakyamuni Buddha is made large. He is symmetrically surrounded by the eight leading bodhisattvas including Manjusri Bodhisattva and Samantadhadra Bodhisattva, Indra, Brahma, two Buddhas, ten disciples including Mahakasyapa and Ananda, sea king and his daughter, and two of the Four Guardian Kings. The main Buddha has the fingers of one hand pointing to the bottom, with the other hand placed on the lap, palm facing up; a mandorla is set behind him. Usnisa (a protuberance symbolizing supreme wisdom) is at the top of the head, with large-sized beads placed at the top of the head and near the forehead. The facial features look neat. The body is shaped like a square, giving a sense of rigidity often found in the Buddhist paintings of the late 18th Century. The Medicine Buddha makes a hand sign like the Amida hand sign. 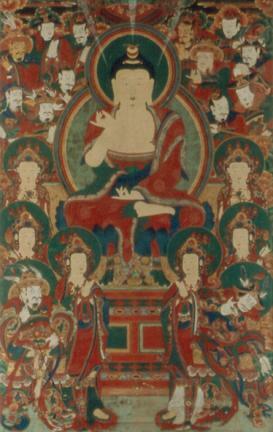 He is symmetrically flanked by the six leading bodhisattvas, two of the Four Guardian Kings, and twelve supernatural guardians. Overall, the look of the figure and the colors and expressions used for this figure are similar to those for Shakyamuni Buddha next to it, but the composition of this one and Amitabha Buddha feels rather loose compared to that of Shakyamuni Buddha. Amitabha Buddha is surrounded by the eight leading bodhisattvas including Avalokitesvara and Mahasthamaprapta Bodhisattva, two of the Four Guardian Kings, two Buddhas, and ten leading disciples that look like Arhats. This piece is an important material for those studying monk painters ranging from Uigyeom, who carried out conspicuous activities in Jeolla-do in the early 18th Century, to Seungyun of the 1780s. As a large-sized painting of the late 18th Century displaying exquisite brush strokes and creating a flamboyant yet subdued atmosphere, it is a noteworthy work.